Hog Roast Chorley is a catering firm with a difference compared to the usual catering services offered today, we offer you the chance to have a taste of the countryside with our range of fresh produce guaranteed to set the senses alight. Hog roast Chorley is the first choice in hog roasting catering, set in rural Lancashire with some of the best farming lands in the UK giving you the opportunity to try some of the best available produce and meats in the country by far. The meats available locally are not to be sniffed at from pig to lamb it really has to be tasted to be believed. Hog roasting can provide you with a stunning centre piece for your special occasion imagine all your guests congregating around your specialised hog roaster taking in the smells and sounds of your very own pig slow cooking giving it real atmosphere and presence. Our hog roasting equipment is so versatile we can cover events and occasions of any size, one pig can and will feed up to 100 people comfortably taking away those catering blues leaving you to enjoy the day without hassle and concern about the food being served or cooked at specific times, we put the produce in and away it goes cooking and smoking to absolute perfection, all you need to worry about is if everyone’s glass is filled. Hog roast hire Chorley can also provide you with your very own hog roasting machine that’s if you want to take on the meat yourself, it really is simple and once you have seen a roaster in action you will realise you could be doing it yourself with ease, hog roast hire Chorley can give you that experience and freedom to season and cook whatever produce you decide to have on the day the way you want it, the way you like it, so don’t be afraid to give it a try. Our staff are of the highest standard and training and will gladly help you with your own hog roast, when our team comes to set you up please feel free to ask them questions concerning the produce of choice, they are more than approachable and want to give you tips and hints on how to make a perfect hog roast, we will help you make sure that your special occasion goes by with maximum efficiency and minimal fuss. All our staff like we say are trained professionals adhering to all health and safety and food hygiene regulations of the current standards set by today’s strict rules and laws concerning catering and food preparation. We all know if you have tried running your own event before or dealt with caterers it can be a real strain on your day, if things don’t go right maybe the food isn’t up to scratch maybe the service isn’t the best, hog roasting eliminates these problems. Due to our equipment being basically self-managing it doesn’t even need watching as the temperature is set and the time is known so when we say it’s going to be ready it’s going to be ready. 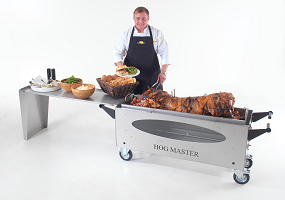 Hog roasting really is a hassle free way to cater for your event. Nearly eliminating all staff it is more cost effective and satisfying than your standard buffet. Hog roast equipment is so adaptable we can operate indoors as well taking away more worry from your event this aspect is the British weather, how many times have you arranged a family BBQ on the promise of the weather report there is going to be sunshine only to be greeted on the day by clouds and rain spoiling your special day. I mean who would want to go to a BBQ when it’s raining but if your guest know you have a hog roaster at your beck and call they are going to come flooding for a taste of your slow cooked pulled pork. Pork is not the only thing we offer as we say we can cater for any event, our hog roasters can cook many things not just pigs, with minted lamb being a top seller, with succulent beef cuts also available for your dining pleasure, we can also give you the very best local chicken and turkey seasoned how you want it, imagine the crispy skin and juicy breast another treat for the senses indeed. With all that said there is only one thing left to do, pick up the phone and order a hog roast today.